I like movies that are a little crazy. Crazy movies have passion and ambition, and while that passion can sometimes be misguided, at the very least it results in something interesting. Tim Burton’s 3D take on “Alice in Wonderland,” on the other hand, is just plain nuts. It has style but no heart, an off-putting ‘weird for the sake of being weird’-ness to it that is more alienating than it is imaginative. And the post-“Avatar” viewing public will not be impressed by the gimmicky 3D. Presumably set in the late 1800s, when the story was written, 19-year-old Alice Kingsleigh (Mia Wasikowska), a rebellious free thinker, is being set up to marry a crashing bore of an English Lord. As the Lord proposes, Alice sees a rabbit in a coat pointing to a stopwatch, curiously matching something she has seen in her dreams for years. She follows the rabbit to his hole, where she falls into a magical world of talking animals and feuding queen sisters, and realizes that these dreams she couldn’t shake were in fact repressed memories from an earlier trip she took to this so-called Wonderland 13 years earlier. This time, though, the stakes are much larger, as Alice must fulfill her destiny as the one who slays the dreaded Jabberwocky, which is owned by the evil, round-faced Red Queen (Helena Bonham Carter). Talk about art imitating life: this movie is literally all fun and games until someone loses an eye. (There’s no blood, but parents beware: it’s still a gruesome moment.) After that, the movie’s attempts at quirky playfulness feel awkward and stilted. The story blends plot lines from both “Alice’s Adventures in Wonderland” and “Through the Looking-Glass,” to the point where the Queen of Hearts and the Red Queen are the same person. This is a textbook case of putting the cart before the horse: if they use elements of “Through the Looking-Glass,” then Johnny Depp can get more face time as the Mad Hatter, and they’ll be able to cast another big star as the White Queen (namely, Anne Hathaway). Now you have a star-studded movie, but so what? The story doesn’t work. The one thing the movie has in its favor is a disciplined cast that makes the best of a bad situation. Helena Bonham Carter has the “Off with his head!” cry down pat, but her best work comes when she lifts an eyebrow or dismisses someone with one word. Anne Hathaway goes full “Wizard of Oz” in her portrayal of the White Queen, which is both funny and slightly annoying. Mia Wasikowska was an inspired choice for Alice, giving her a combination of bewilderment and quiet confidence. Of the voice actors, Alan Rickman and Stephen Fry steal the show as the Blue Caterpillar and Cheshire Cat, respectively. Casting Crispin Glover as the Red Knave was a noble attempt at playing against type, but Glover is not up for the task. Depp, meanwhile, is all over the place as the Mad Hatter. Out of nowhere, he’ll recite poetry in a Scottish brogue. He’s more maddening than mad. Then there is the 3D aspect of the movie, which doesn’t have any of the depth or subtlety that recent 3D movies have shown (“Avatar” and “Cloudy with a Chance of Meatballs,” to name a couple). In many cases, everything blows by so quickly that it’s difficult to focus on the action. Even the standard CGI is awkward; there is a scene where the Red Knave mounts his horse, and not one second of it looks real. 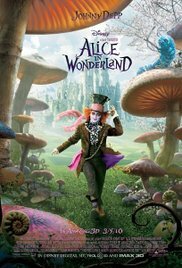 You would think that a director like Burton would be at home in the Lewis Carroll universe, and maybe that is part of the problem. In trying to painstakingly capture Carroll’s look, he lost sight of Carroll’s voice, an understandable side effect of merging two stories into one. This “Alice in Wonderland” is all glitz, no soul. This originally ran March 4, 2010 on Bullz-Eye.com.